Burgers will always be one of my food loves. It's the one food that I can eat probably every day especially with all the ways burgers can be topped and made. 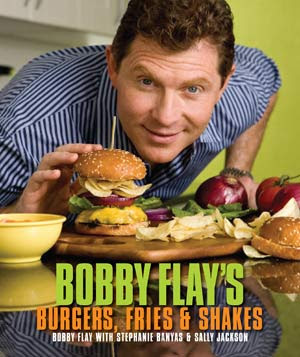 One of my favorite cookbooks is this one from Bobby Flay. His burger recipes are simple and so flavorful! There's no fuss with the burger itself but the creativity he has in topping the burgers is really what draws me in. It's been awhile since I cracked open this cookbook and with my constant craving for burgers, I flipped through and made his Trattoria Burger for dinner. The Trattoria Burger is essentially a burger topped with a caprese salad. Three ingredients - fresh mozzarella, ripe tomatoes and bright basil leaves - make this such a satisfying burger all in itself. How could such a simple topping make this a bad burger?! Served with garlic parmesan fries, this is an awesome burger and fries dinner! This burger gets its inspiration from Italy's insalata caprese, which is a simple yet totally delicious layering of fresh mozzarella, ripe tomato slices, and basil leaves. Basically, I just transplant that salad onto a burger. Because it is so simple, it is of the utmost importance that each ingredient be in its prime. That means only the ripest, tastiest tomatoes, the freshest, creamiest mozzarella, and the brightest green basil will do. All i takes to dress this Italian trifecta is a splash of balsamic, olive oil, salt and lots of freshly ground black pepper." Divide the meat into 4 equal portions. Form each portion loosely into a 3/4 in thick patty and make a deep depression in the center with your thumb. Season both sides of each burger with salt and pepper. Cook the burgers, using the oil and topping each one with 2 slices of cheese and a basting cover during the last minute of cooking. Place the burgers on the bun bottoms and top with sliced tomato and 2 basil leaves. Drizzle each burger with 2 teaspoons balsamic vinegar and 1 teaspoon olive oil. Cover with bun tops and serve immediately. Mmmm! I have all the ingredients at home :) Trying them tonight... although I think I'll put shredded mozz in the burger to see how it tastes. I love burgers. Good burgers, greasy burgers, juicy burgers-- I've never met one I didn't like. The toppings definitely make the burger. they were a HUGE hit in my house. thanks joelen! I love this idea! I'm going to keep this in mind and make it for a nice summery meal when it gets warm. The cheese on top looks so good!